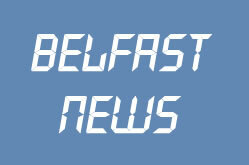 Belfast News You'll Never Get to Heaven This Way! Belfast News: You'll Never Get to Heaven This Way! Whether you go to church, whether or not your a Christian, whether you can sing like an angel or not, surely we all know you can't get to Heaven this way! This worker who clearly has a head for heights, started his climb towards the heavens whilst working on the East Belfast churches' spire. You could get dizzy just looking at him! Ps: Just remember if you want to get to Heaven, you meet God inside the church. You'll soon get to the point if you try climbing the outside!